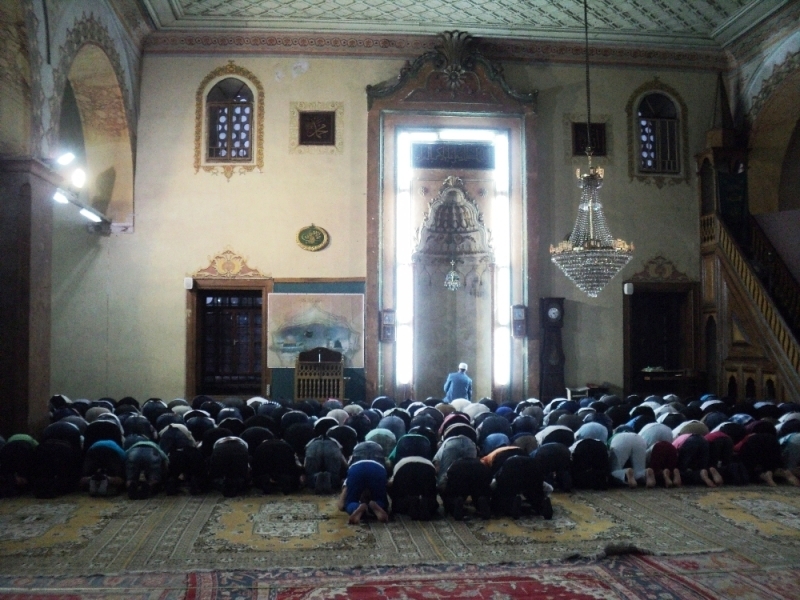 How does a Ramadan Bayram prayer look to someone from a Christian family? Probably similar to Easter, but without the women, for whom we know don’t pray in the mosque according to their religion. I don’t really have a smart excuse for why I have not visited this object in the 30 years of living in this city, from which 10 were going through school and working near it. A possible influence Is that my religious background is different, so because it’s a mosque, I’ve seen it as something that “belongs to others and I have nothing to look for there”? No reason to lie to you, unfortunately, opinions like that survived even in the 21st century. Yet I still haven’t visited any historical Churches or any kind of monuments in Skopje, and on the other side, old mosques were always on my “go to “ list in any city I have visited in the Balkans. So it ultimately goes down to the feeling that your city will be there tomorrow and there is no need to rush it. 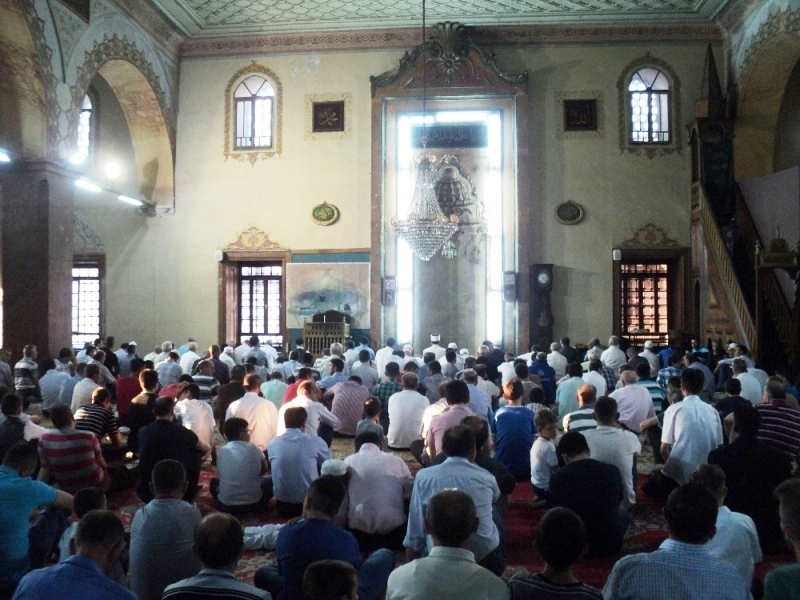 But, the day has came, I woke up before dawn and headed to the Sultan-Murat mosque for Ramadan Bayram. 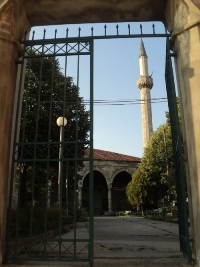 This Mosque is built in 1435 and it is Skopje’s oldest, and according to other sources it’s oldest in the Balkans. It was unusual, soaking in the calmness and quietness despite the crowd of people. We are all used to see muslim neighborhoods in the central parts of Skopje as pretty lively and noisy, with traiders and buyers in every corner of every building, but this was something totally different. In 5am there weren’t a lot of people, only a third of the mosque was filled. But it is pretty big, even for today’s standards, it is still one of the biggest mosques in the country. 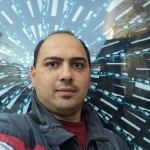 Which is also impressive, knowing that it’s rivals are buildings made out of modern materials and technology. 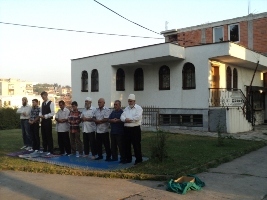 When the sun rose from the behind of Gazi Baba’s hills and lit it’s eastern wall for the 211-thousandth time or more, it was getting crowded, and many believers prayed in the mosques yard. 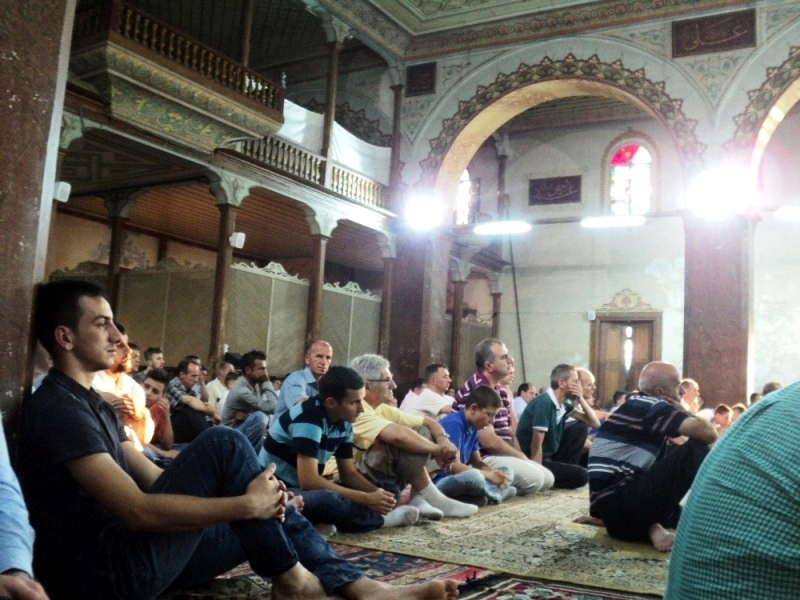 How does a Ramadan Bayram prayer look to someone from a Christian family? Probably similar to Easter, but without the women, for whom we know don’t pray in the mosque according to their religion. There’s the prayer, than a speech, than a prayer again… Instead of a priest there is an imam, instead of crossing there is a bow, those are tiny differences. Speeches held by imam’s are similar to those of the priest in Churches, before everything you should be a good man and a good believer, be thankfull to God for everything you have, take good care of your family etc. 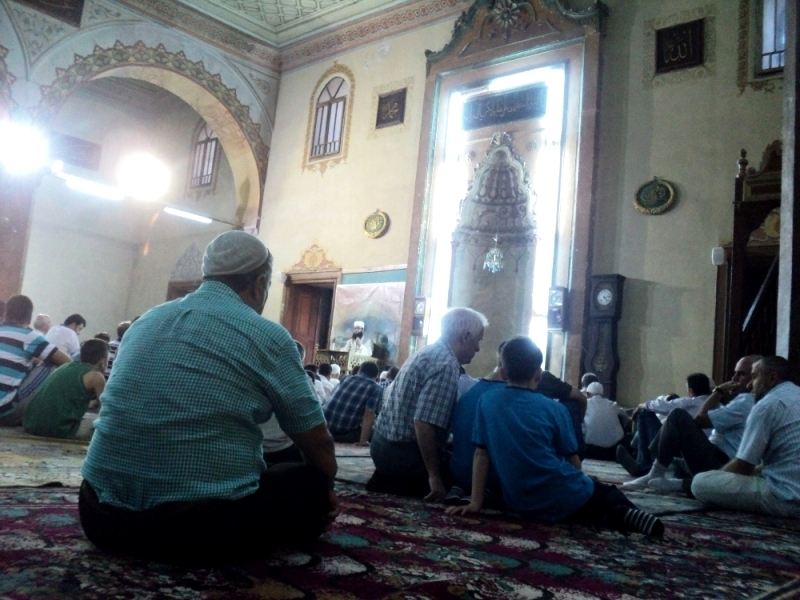 But imam Xhabir in Sultan-Murat’s Mosque had something else to say about the modern way of living. -The devil comes out of your computers, you have to be careful, Computers are good when used for something useful, but not for sins, Parents need to take care of their children’s actions, said the imam. 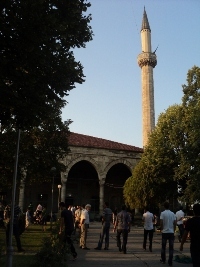 Sultan-Murat’s Mosque was built 582 years ago as a legacy to Sultan Murat II. It is built in the place of a Church by the name of St.George. It is a simple square object, it’s not very decorated, but the little decoration that it has draws your attention. 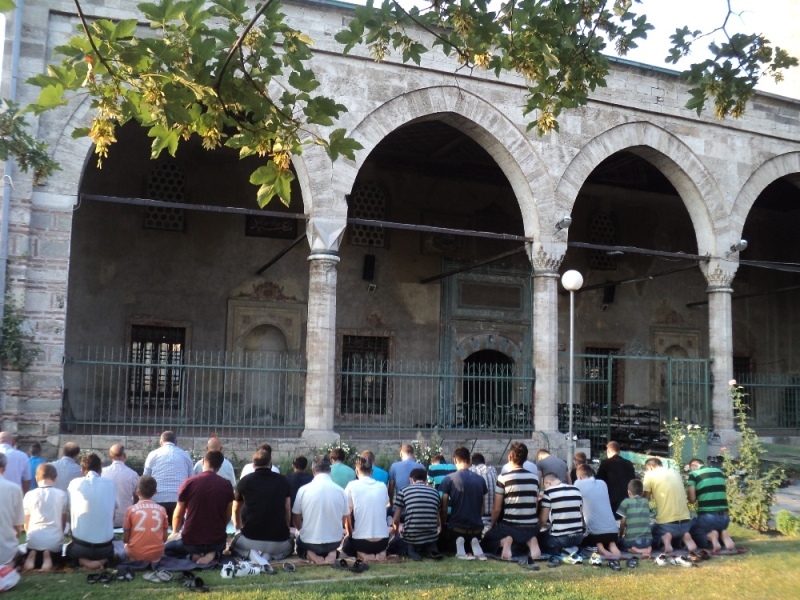 It is Skopje’s only mosque with a Sultan-donor, the rest belong to pasha’s and bey’s. It was damaged and repaired for several times ,In the fire of Picomini in 1689, the 1963 earthquake and others, so it’s believed that it’s appierence today is very different from when it was built, but despite, it is one of the most meaning full objects in the city. 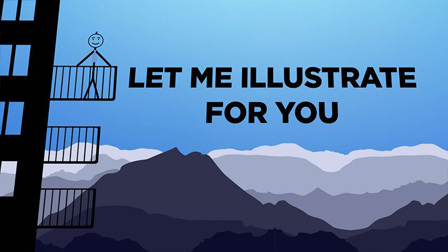 It sits on top Virgins hill, it dominates the surrounding space, but it is not easly accessible because of the narrow streets, so locals are very polite and they show you the path. 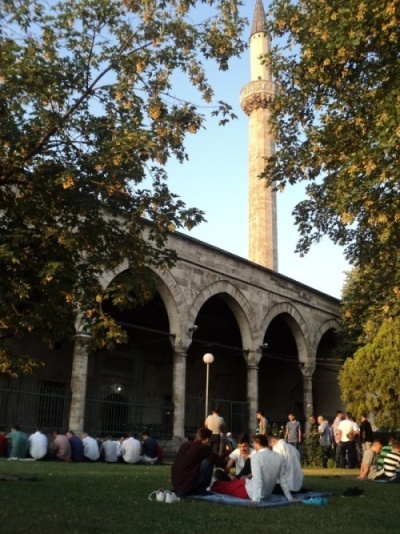 Sultan-Murat’s Mosque is many people’s favorite place. We met Remzy who is a local, and we started talking about the mosque and he looked to the roof of the mosque. Made of shingles. -There weren’t roofs like this one in those times, we know that a mosque’s roof is a dome. Every mosque that has a shingle roof had a dome roof but they were bombarded in WW2. It is shameful land unfortunate! 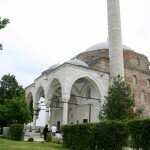 Fortunately the dome’s of Mustafa-pasha’s and Isa-bey’s moque roofs were intact. 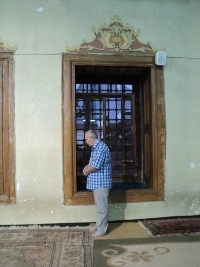 But we will build a new dome for this Mosque, we will need 2/3 million euro’s to collect and we will do it, he said. We said farewell to Remzy, who was in a hurry for his breakfast, and after a whole month of feasting he returned to usual eating habits. 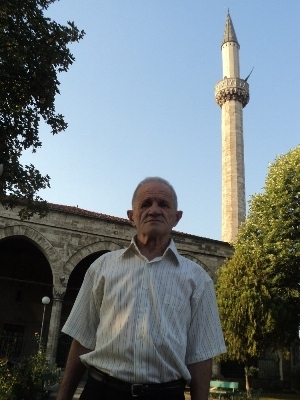 We wished him a happy Ramazan Bajram with a wish for many years of celebration in Sultan-Murat’s Mosque. 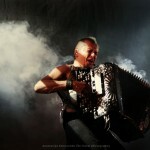 To all Balkon3 friends who celebrate this day we wish a happy and blessed holiday.